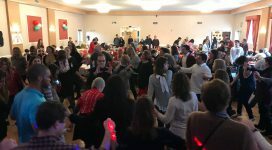 Bulgarian Cultural Center aims to unite Bulgarian communities in the tri-state region and all those who have special interests in Bulgarian culture. 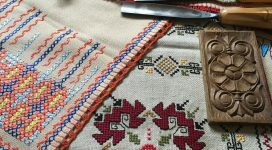 Our vision is rooted in a broad understanding of the Bulgarian cultural heritage that includes both traditional and contemporary art forms, customs and traditions, language, history, social and ceremonial practices. We strive to present our cultural and aesthetic values in their relationship to the universally human ones. Through our network people of various interests will come together to share knowledge, talent, creative ideas or simply spend time with friends and family while sampling favorite dishes of the Bulgarian cuisine. Some of our events are more deeply focused on the Bulgarian traditional music, dance and craft. 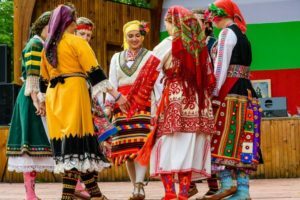 Our annual Bulgarian Festival brings together musicians, dance groups and visual artists to celebrate one of the most respected Bulgarian holidays – May 24th, the Day of the Bulgarian Alphabet and Literature. The participants in the Festival can engage in hora circle dances, enjoy the music performed on typical Bulgarian instruments such as kaval, gaida and tapan or that of the talented vocalists presenting authentic folk songs as well as favorite popular ones; they can try creating a woodcarving or a hand-painted silk scarf or have a nice conversation over a cup of coffee. The Festival inspired the creation of several folk dance clubs in the region, which we hope will continue to grow in both size and repertoire. 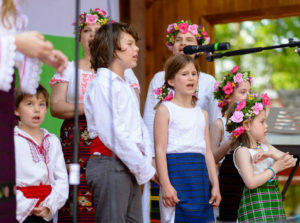 It is our deep desire to see the development of Interest Groups that will bring together people involved in folk music, dance or craft, Bulgarian classical or contemporary music, Bulgarian poetry and literature. 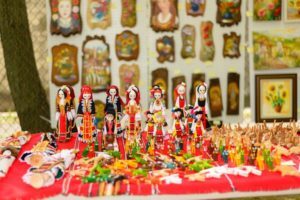 We want to encourage the development of School of Bulgarian Traditional Crafts, where young and old can try their hands in woodcarving, metalwork, weaving and embroidery, ceremonial breads or pottery. As a part of the School activities we will offer workshops in ritual objects related to important Bulgarian holidays such as martenici making around March 1st, pisani yayca around Easter, enyovski venci za zdrave around St. John the Baptist, koledni obredni hlyabove for Christmas or survachki for New Year’s Eve. We will search for artists who can share their knowledge and skills with the Bulgarian community or anyone interested in learning and creating. It is especially important to us to have Bulgarian Schools at several locations in the region where our children can learn Bulgarian language in its conversational and written forms as well as highlights from the Bulgarian History, Arts and Literature. Other events of the Bulgarian Cultural Center will focus on readings, discussions or lectures presented by Bulgarian writers as well as scholars, film screenings of Bulgarian documentaries or other contemporary works as well as concerts in traditional, classical or various genres of the contemporary music. For such events we will invite both people residing in the region as well as visiting from Bulgaria. We are planning to work in close partnerships with individuals and Bulgarian cultural organizations both in the US and Bulgaria who share our vision and work towards common goals – preserving, presenting and perpetuating the Bulgarian cultural heritage outside the homeland.